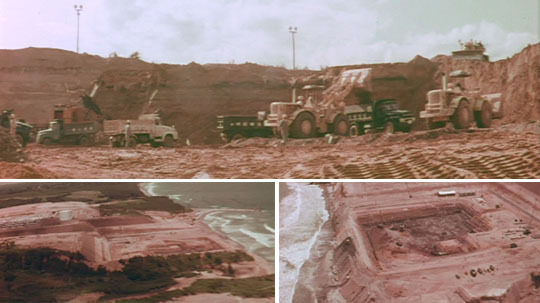 Ground zero: Bulldozers (top) take the top off a 35-meter bluff to prepare the site for the Fukushima No. 1 nuclear plant in the late 1960s in this image taken from the documentary "Reimei" ("Dawn"). Left: The construction site is seen after the leveling work. Right: An excavated area where the emergency diesel generators were installed is seen at the construction site. | TOKYO ELECTRIC POWER CO. The March 11 monster tsunami that hit the Fukushima No. 1 nuclear plant destroyed the critical backup power system and triggered the meltdown of hundreds of fuel rods in reactors 1, 2 and 3. Video of the appalling damage and reactor building explosions led many — from regular people to nuclear and quake experts — to ask: Why wasn’t the coastal nuclear plant built in a location safe from all tsunami threats? “When I see the situation now, I feel it was wrong to clear that much of the hill away,” said Naganuma, who worked at Tepco’s local office preparing for the construction in the late 1960s. “If they did not dig the ground down that much, we would not have faced this situation. (The nuclear disaster) would not have happened,” he said. Naganuma, like thousands of other local residents, has been forced to evacuate from his home close to the crippled plant as it continues to spew radioactive materials. 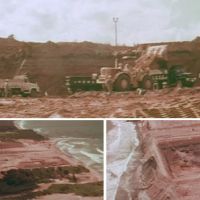 Recent interviews and past documents examined by The Japan Times show it was Tepco’s decision to cut away the bluff so the nuclear complex could be built on low ground, leaving it vulnerable to massive tsunami like the one that struck on March 11. Tepco dug another 14 meters below the surface to create basement floors, including those for the turbine buildings, where the emergency diesel generators were installed. The tsunami easily flooded the compound and knocked out the power systems, including those for running the critical reactor core coolant equipment. The meltdowns became inevitable. But Tepco is not the only one to blame. Like the utility, nuclear regulators and seismologists in the 1960s all believed a major earthquake and massive tsunami would never hit the plant, documents and records show. “In the past 700 years, Fukushima suffered almost no noteworthy damage from earthquakes except in the Aizu area (in current Fukushima Prefecture),” concluded a 1966 report attached to the application form that Tepco submitted to the government to seek approval for building the first reactor at the plant. “Thus the site can be described as an area of low-seismicity, even compared with all the other areas of the country,” the paper concluded, with little mention of the tsunami threat. 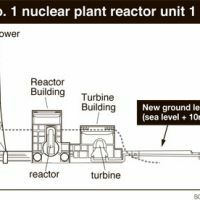 The paper was based on earlier research by seismologists and was approved by the government, which gave the green light to build reactor 1.In designing the Fukushima No. 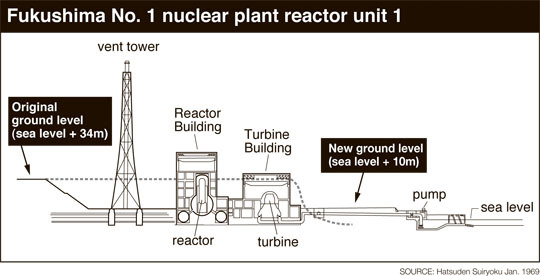 1 plant in the 1960s, Tepco estimated the maximum possible tsunami would be only up to 3.1 meters. In 2002, however, following recommendations from quake experts at the Japan Society of Civil Engineering, Tepco modified the facilities, so they could withstand tsunami of up to 5.7 meters. This was also approved by the regulators. During a recent interview with The Japan Times, Masatoshi Toyota, 88, former senior vice president of Tepco, said one of the reasons the utility lowered the bluff was to build the base of the reactors directly on solid bedrock to mitigate any earthquake threat. Toyota was a key executive who was involved in the Fukushima No. 1 plant construction. It is actually common practice to build primary nuclear plant facilities directly on bedrock because of the temblor factor. Toyota also cited two other reasons for Tepco clearing away the bluff — seawater pumps used to provide coolant water needed to be set up on the ground up to 10 meters from the sea, and extremely heavy equipment, including the 500-ton reator pressure vessels, were expected to be brought in by boat. If the seawater pumps were placed on high ground, their operating costs would be accordingly higher. “We decided to build the plant at ground level after comparing the ground construction costs and operating costs of the circulation water pumps,” wrote Hiroshi Kaburaki, then deputy head of the Tepco’s construction office at the Fukushima No. 1 plant, in the January 1969 edition of Hatsuden Suiryoku, a technical magazine on power plants. Still, Tepco believed ground level was “high enough to sufficiently secure safety against tsunami and typhoon waves,” wrote Seiji Saeki, then civil engineering section head of Tepco’s construction office, in his research paper published in October 1967. Engineers at Tohoku Electric Power Co., on the other hand, had a different take on the tsunami threat when the Onagawa nuclear plant was built in Miyagi Prefecture in the 1980s. Like Fukushima, the plant was built along the Tohoku coast and was hit by tsunami as high as 13 meters on March 11. Before building the plant, Tohoku Electric, examining historic records of tsunami reported in the region, conducted computer simulations and concluded the local coast could face tsumani of up to 9.1 meters. Tohoku Electric had set the construction ground level at 14.8 meters above sea level — which barely spared the Onagawa plant from major damage from 13-meter-high tsunami that hit in March. Former Tepco worker Naganuma said many locals now feel they have been duped by Tepco’s long-running propaganda on the safety of its nuclear facilities, despite the huge economic benefits the plant brought to his hometown of Okuma, which hosts the Fukushima No. 1 plant. Before construction of the plant, the coastal area was a barren, little-populated highland dubbed the “Tibet of Fukushima.” At the time, most local residents eked out a living in agriculture, and needed to go out of town as seasonal migrant workers during winter. But the plant brought stable jobs, tax revenues and other big money projects to the local economy. Naganuma said many local residents now feel badly betrayed by the nuclear plant. “But I think now more and more people (nationwide) have started feeling that way after March 11,” he said.